It’s the time of year when our children are excitedly presenting us with their Holiday Wish Lists and if your children’s lists are like the ones I’ve received Barbie is a name that is right at the top. Each and every year Barbie manages to come out with new products that my children adore. This year I’m excited to present to you two of the new Barbie product line which I know your children would love to find under the Christmas tree! Take the gang on the road with Barbie™ Life in the Dreamhouse – The Amaze Chase™ Glam Camper!™ Built for glamping, this amazing RV holds more than meets the eye! From the outside, it promises sensational style and aaah-mazing adventure! When it’s time to stop for the night, disconnect the cab and open the camper to reveal multiple play spaces with all the comforts of home, plus a few fabulous extras! There’s a complete kitchen, with refrigerator, stove and oven – both with working doors. Grab a snack or a beverage, perhaps a pink lemonade from the dispenser. Or grill up a meal on the barbecue, then flip the grill – it turns into a table, the perfect place to eat dinner! Two decorative pink stools make classy camping chairs. After dinner, enjoy girl talk and ghost stories at the campfire over s’mores. When the fire goes out, the tired campers can enjoy sweet dreams with plenty of cozy places to sleep. A double bed, with soft blanket, and two bunk beds fold down ensuring all four sisters have a place to sleep on family vacations. Catch up on news back home or favorite shows on the TV, which flips out for easy viewing. A fabulous bathroom is perfect for cleaning up after a day of adventure – the full bathroom comes complete with a polka-dot shower curtain. Additional accessories expand the storytelling fun – like plates, a frying pan and s’mores. There’s even a pink “crystal” chandelier to put the glam in glampsite! Collect Barbie® doll, her sisters and their friends to head out on the road for an aaah-mazing adventure (dolls sold separately). The Holiday Barbie Doll is one of the longest running series of collectible Barbie dolls. Since 1988, these dolls have imagined Barbie at the center of a fantastic and glamorous holiday event – one requiring a gown that’s unique, festive, luxurious and stunning. 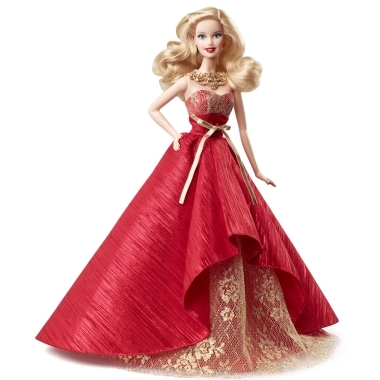 In 2014’s special occasion gown, Barbie doll has never looked more shimmery and radiant. This year, Barbie has returned to traditional colors. A rich red fabric modernizes a classic silhouette. Golden lace peeks out from under the full, floor-length skirt and adorns the top of her strapless bodice. A bright gold-colored bow accents her waist with long ends. If you’re looking for Christmas gift ideas for more people on your list, make sure to check our the rest of our Holiday Gift Guide features and don’t forget to join us for the #HolidayGifts2014 Twitter Party on December 9th at 9pm EST. RSVP HERE. My amazing friends at Barbie have given us a WONDERFUL prize for one very lucky Canadian reader. 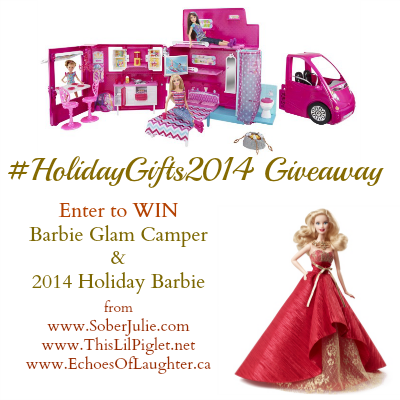 We are giving away a prize which includes a Barbie Glam Camper and the 2014 Holiday Barbie Doll!!! Entry is simple, just fill in the form below. All entries will be verified, this contest ends on Decmeber 8th, 2014. The winner will have 48 hours to respond. My 6 year old daughter! She has the Barbie Glam Camper as her #1 on her wish list this year! Thanks so much for the chance! I would give this amazing package to my niece. I would give this to my granddaughters who are 9 and 8, sisters who love Barbie! I would give this to my niece! She is obsessed with Barbie right now. I am pretty sure my 4 year old would LOVE this! My granddaughter would be the lucky recipient of this gift. This beautiful gift would be going to my lovely granddaughter!! I would give this to my daughter, she loves anything to do with Barbie dolls. This would be for my 6 year old daughter who loves Barbie as much as I do!!! I would give it to my 4 year old daughter – she loves Barbie so much! I would give this amazing Barbie prize to my beautiful granddaughters. Instant “Best Nana in the World” Award. Thanks for the chance to win them, and good luck to all. My 7 yr old niece Leila! My beautiful ‘Barbie’ crazy granddaughter would love this! Did I say LOVE! My granddaughter would love to receive this Barbie prize pack. My niece would get this and go crazy! My daughter adores barbie and would love this prize under the tree for christmas! We are big big Barbie fans….awesome contest and love your blog and facebook! Would love to give this to my bf’s 6 year old. So we can play with it together! My little sister collects Barbies and would love the Holiday doll. I would give this awesome prize to my god daughter! I would be giving this to my daughter for Christmas. She would really love this!! My daughter would love this Barbie prize pack! My girls would be thrilled with this prize pack as they love Barbie! My daughter would be over the moon for this. My little niece would love it ! I’d give it to my neighbors daughter. she’d love this. I would give this to my daughter Hailee who is 9. She loves Barbie and every year asks for the Holiday Barbie! My Daughter would get this. Oh the fun we could have!!!! How much fun! I love Barbie and so does my niece. this would be such a great gift for her! My 4 year old is apparently entering her “Barbie years”. As such, I would love for her to be able to open this on Christmas morning! I would give this to my 9 year old niece! I would give the Barbie prize to my daughter. My daughter, She would LOVE it!! I would give this to my daughter. She’d really love this prize. This would definitely go to my Barbie loving daughter Maybelle. This would be a fantastic present for my niece. I would give this to my daughter, Kenzie. When asked what she wants for Christmas, she says, Barbies, Barbies, and more Barbies! My niece loves Barbie and I would definitely gift to her! 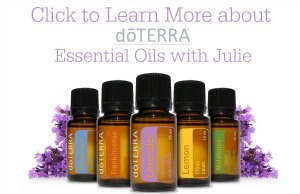 Thanks so much for the blog! I would love to give this amazing Barbie to my niece she would just love it! I would give this amazing Barbie prize pack to my daughter, who LOVES Barbie!! I would give this to my 2 girls 5 & 8! They would love this! This would be perfect for my niece. She loves dolls. I would give it to my niece if I won! She would be thrilled! I would give this to my 7 year old – BOTH of these items are on the top of her wish list this Christmas!! Would be amazing to win!! My niece . She is a die hard barbie fan! I would give this Barbie prize package to my granddaughter. I would give this to my goddaughter! I would give this Barbie to my niece. I would give this to my 6 year old daughter. She would love it! My niece is quickly growing into that Barbie age…I would give this all to her. Geese I hope that when I turn 55 I look just as good as Barbie <3!!!!! I would give this amazing prize to my granddaughter. I would keep the doll for my daughters and donate the camper since they already have one! I would give it to my daughter. She loves Barbie’s and likes to play with her friends. I’d give this amazing prize to my amazing 4 year old daughter <3! I think my 7 year old would love love love this one. I would give this to my niece’s little girl. My lo would love this! I’d give it to my nieces! They love Barbie! We have delightful new (immigrant) neighbors and I love their nice and very polite kids. The little girl Asha would receive the barbie if I won! I loved (still do) Barbie as a kid and would play for hours with her and I would love to give the Barbie Glam Camper and 2014 Holiday Barbie Doll to a very special little girl…………my grand daughter, Lexie so that she could make her own special memories playing with Barbie. I would probably give to my bff’s daughter. I would give this amazing prize to my daughter, who is a Barbie fanatic!! I would give the prize to my niece, Dani, she would absolutely LOVE it! I would gift this to a deserving child. I want to win this for my co-workers daughter. My niece is too young, so I would give this prize to my friends daughter. My grand daughter would really love this for Christmas. I would give this wonderful gift to my granddaughter. I would give it to my daughter.. I would give this amazing package to my daughter. I would love to give this Barbie to my granddaughter. I have a gorgeous little 3 year old girl that I take care of that is obsessed with all things Barbie! She would love this! Thanks for the chance! For ME! I am the same age as Barbie! I still have mine. I take them out when I need to ground myself and focus on the real me. The playful, relaxed me! My young daughter would love this beautiful barbie! My daughter absolutely loves her barbies. She would light up if this was under our Christmas tree Christmas morning. Thank you for the chance to win. Good luck everyone & HAPPY HOLIDAYS!! little cousins would love it! This gift would be perfect for my niece. I would gift this amazing Barbie to my preschool aged neice! Thanks! If I win, I will give it to my daughter , she LOVES Barbie! I’d give it to my daughter! She’d love it! Oh man! Just realized this is open to Canada only. Sad face. You can disregard my entries. This would go to my little niece. I would give this to my adorable goddaughter! A lucky girl form the giving tree a work! my girls would love this for the holidays! they love barbie! I would give this amazing prize to my daughter. My niece would freak out if she saw this under the tree! My granddaughter would love this one. I would give this Barbie prize to my niece! I would give this to my daughter who loves Barbie. I would give this to my nice. I know she’d love it! This would be for my girlfriend’s daughter! I would give this to my daughter for her birthday! I would give this wonderful prize to my granddaughter. Wow, my niece would LOVE this!!! My 3 year old granddaughter would be over the moon for this gift! It would be so special if I could give this to her! Thanks for the opportunity! I will be giving this to my niece. I would give it to a girl that I know. I’d give it to my daughter. She’s always wanted one.